If there's one phrase that sums up Russell Begaye's campaign for Navajo Nation president, it's this: Nation building. Begaye, who was elected four years ago to serve as Shiprock's sole delegate on the Navajo Nation Council, wants to bring strong business sense, traditional values and new concepts of government collaboration to the office of top executive. "Nation-building is at the top of my list when I walk into the president's office in January," he said. "All things work together. That's a basic Navajo teaching." Begaye calls this concept "matrix thinking." It means a return to the Navajo belief that everything is connected and with true collaboration great things can be accomplished. 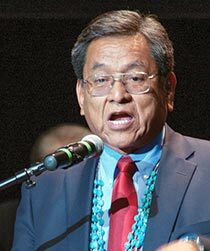 >By contrast, the three branches of the Navajo government for too long have operated in what Begaye calls "silo mode." "The biggest struggle right now is working in silos," he said. "Each division does its own thing, has its own plan, budget, personnel, goals and objectives. There is no collaboration in place, no putting funds together to accomplish things." Begaye's top priority is to develop strategies that address reservation-wide issues and pursue them aggressively. "Everything we do has to be part of an overall strategy of building the nation as a whole," he said. "We need to get rid of the concept that we're separate. We need to collaborate and use the funds we have to really address the pressing needs." Begaye was born and raised on a farm in Shiprock. He graduated from Shiprock High School and continued his education at the University of California, Los Angeles. He worked in a variety of business sectors, including housing and construction, before returning. He hopes to use his business savvy to introduce new ways of building the tribe's economy. "I look at everything through the eye of business," he said. "The way I know how to raise the nation to a new level is by looking at it the same way." Begaye points to the tribe's rich history of thriving in a "desert economy." He believes everything the tribe needs can be found on the land. With strategy and vision, the tribe can cut unemployment by half, he said. "We've lived here for thousands of years," he said. "If this was not a place where we could survive, we would have gone extinct a long time ago." The secret, he said, is to view everything in terms of how it builds the entire nation. For example, successful enterprises like Navajo Agricultural Products Industry still purchase items like baling wire and burlap sacks from outside sources. Navajo workers could be employed to make those products, Begaye said. The nation commonly purchases building materials, concrete and other products from non-Navajo businesses, he said. Similarly, Navajo entrepreneurs often sell products for a fraction of what they're worth because they're not tapping into a global market. A shift in thinking can begin to correct this, Begaye said. Once business opportunities are available, other long-standing issues will be resolved, he said. "When we employ a lot more people, housing will follow," he said. "After housing, grocery stores go up and convenience stores, followed by movie theaters and clothing stores. Business follows business." With more jobs available, the nation can offer scholarships to the youth and internships on the reservation. After four years of college, young people can return to the nation and have a job waiting for them, Begaye said. "We have everything we need here," he said. "It's just a matter of using what we have with a new vision." Begaye believes his experience as Council delegate gave him knowledge of the inner workings of the Navajo government, including its relationships with state and federal governments. As president, he wants to use this knowledge to develop collaborative strategies with all entities. That's a reversal from how the government works now, he said. "We talk about roads and housing and water," he said. "But we're trying to build roads without addressing the other things. We're trying to fix a leaking boat by patching holes instead of addressing the cause of the leak."